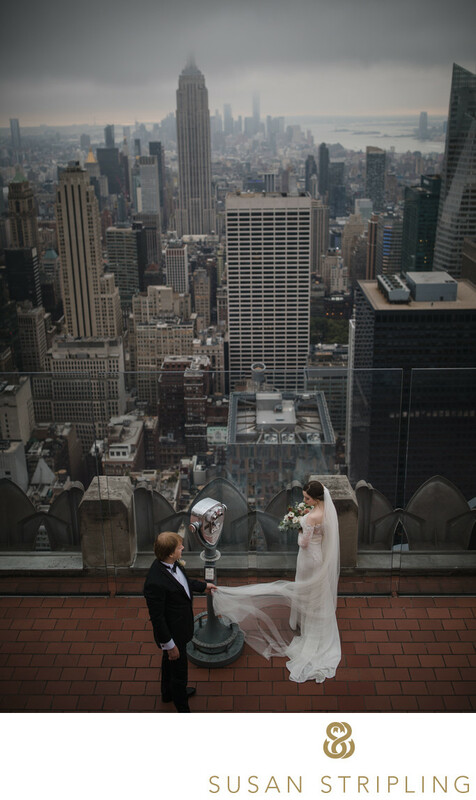 When my first clients suggested going to Top of the Rock for their wedding pictures, I was hesitant. As a Brooklynite myself, I had never visited the Top of the Rock. It seemed like it would be a huge, crowded, difficult-to-navigate tourist attraction. I was surprised and pleased to find it a completely pleasant experience! 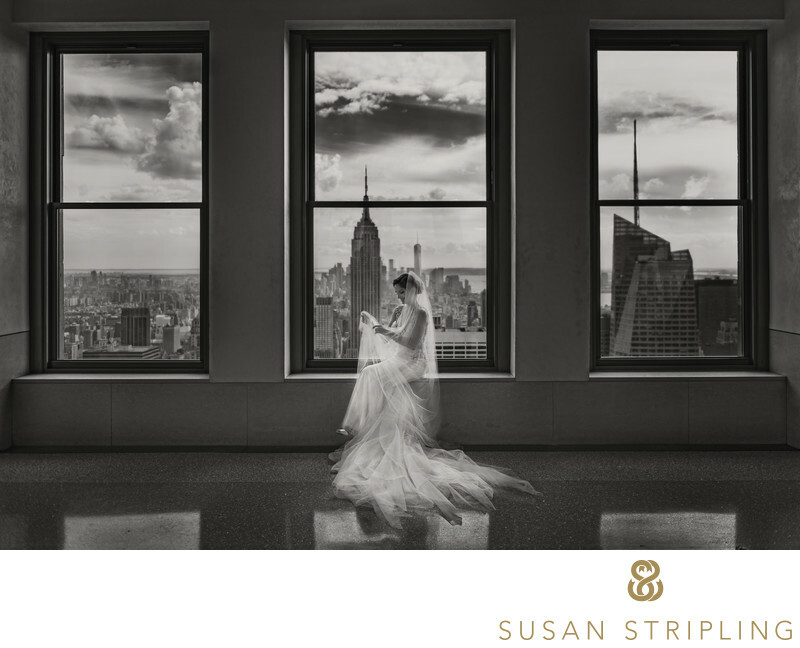 It can often be hard to find good locations to shoot the New York City skyline, especially on a Manhattan wedding day. 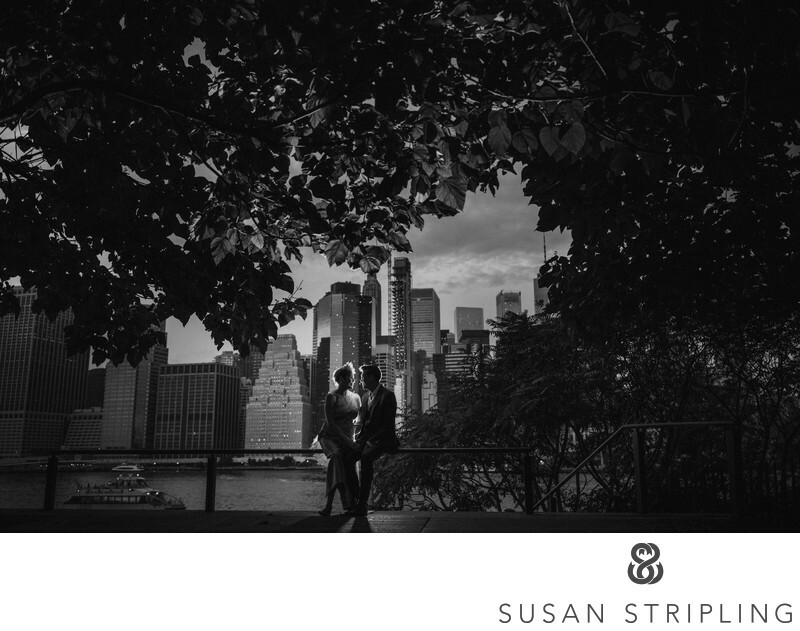 Unless brides, grooms, their families, bridesmaids, and groomsmen have time to travel from Manhattan to Brooklyn to shoot in Brooklyn Bridge Park, there aren’t many great places to see the views. I love shooting in Brooklyn Bridge Park and along the Brooklyn Promenade because it does allow you an amazing vantage point of the city, but time doesn’t always permit that. Manhattan traffic can be notoriously tricky. It’s not always easy to get from one Manhattan wedding location all the way to Brooklyn in the tight timing of a wedding day timeline. 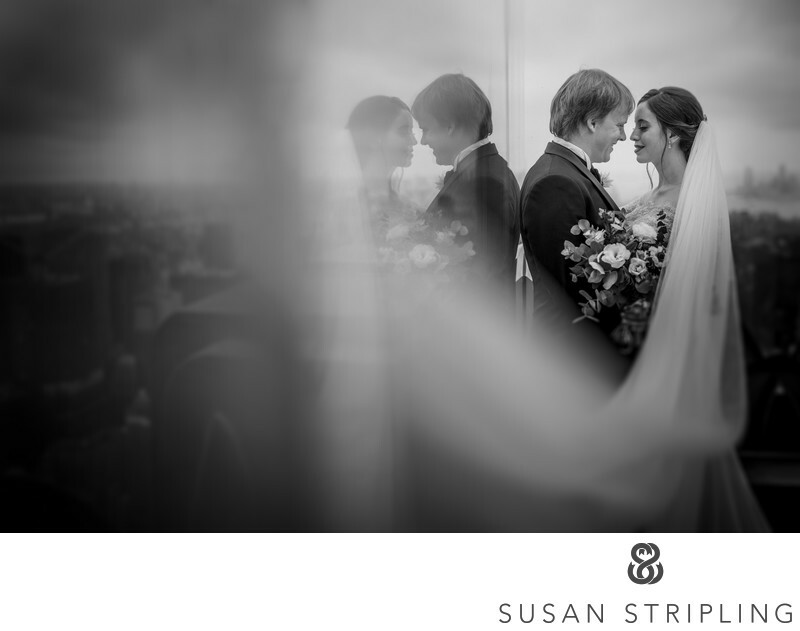 Enter Top of the Rock for your Manhattan skyline wedding portraits. Top of the Rock is located centrally in Manhattan, in a neighborhood that’s fairly easy to get to no matter if your wedding is in Tribeca, Central Park, the Upper West Side, the Upper East Side, Times Square, Hell’s Kitchen, the West Village, the East Village, Battery Park, or anywhere in between! Rockefeller Center is an amazing place. Most known for Radio City Music Hall and the Rockettes, Rockefeller Center is also well known for it’s famous yearly Christmas tree and tree lighting ceremony. There is great shopping to be had here, from Saks Fifth Avenue to the biggest Anthropologie I’ve ever been in! I remember visiting Rockefeller Center when I was in college and being awed by the winter skating rink and throngs of tourists and locals alike. Top of the Rock is located right in Rockefeller Center, which is a difficult place for wedding day portraits. It’s always crowded and busy, and tourists and locals are everywhere. It’s hard to carve out an intimate location to photograph a bride and groom or bridal party together without people in the foreground and background of the pictures. Enter Top of the Rock! I was so surprised by how kind the staff there was. They welcomed us onto the observation decks with open arms. We spent some time on the observation decks, shooting towards the iconic Manhattan skyline. There is so much to see up on the Top of the Rock! We took portraits first near the Radiance Wall. The Swarovski Radiance Wall is created of glass, fiber-optic lights, and gleaming panels. It makes for a beautiful backdrop for wedding day portraits. There are three floors from which you can view the skyline, and we took advantage of all three! The 67th, 69th, and 70th floors all have incredible views. While we made great portraits in all of these locations, my favorite spot was near the elevators! We were walking to go up from one level to another, and I saw the three windows side by side. I was entranced by the view of the city, as well as the reflection of the windows on the shining floors. No matter how amazing your location, you’re only as good as your clients. This particular bride embodied an extraordinary grace and poise. It was a delight to photograph her, and this portrait exemplifies everything that I love about an elegant bridal portrait. I asked her to simply sit in the middle window. I then asked her to play with her long veil and fluff up her elegant dress. I stepped back and simply observed the moments that unfolded after that. I directed the bride into her location, but the ensuing moment and gesture are all her own. I find that the more I allow my clients to be themselves in their portraits, the more the images reflect their personalities! 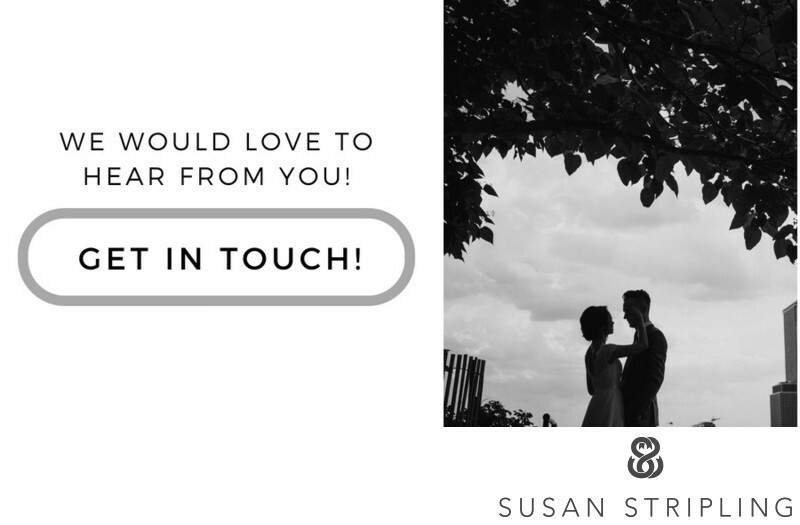 If you'd like part of your day to involve photography at Top of the Rock, if you're considering eloping here, or just want to talk about your wedding photography in general, click below to get in touch! 1/1000; f/2.8; ISO 100; 29.0 mm.